Connected Smart Cities involves companies, entities and governments in an event which has as a mission to find the DNA of innovation and improvement for cities more intelligent and connected to one another, whether they are small or megacities. There have already been done 363 meetings gathering more than 50 representatives of municipal governments with more than 90 companies in the sector. Situated within Paulista’s Avenue privileged area, Frei Caneca Convention Center is located on the 4th, 5th and 6th floors of Shopping Frei Caneca. One of the busiest event venues in the city of São Paulo, it has an exposition area of 10.500 m² with capacity to attend up to 3.800 seated people in modular rooms. Frei Caneca Theatre (on the 7th floor) can also be used as a premium auditorium, with capacity to attend 600 seated people. 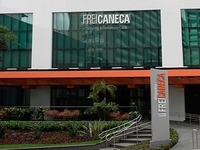 Centro de Convenções Frei Caneca is located inside Frei Caneca Shopping mall, in the Consolação neighborhood. This venue is located in avery central area, next to Avenida Paulista, a large financial center in São Paulo. If you are looking for places for a shopping spree next to Centro de Convenções Frei Caneca, aside from Frei Caneca Shopping mall there are other options like Center 3, Shopping Pátio Paulista,Shopping Cidade São Paulo and Rua Oscar Freire. There is also an abundance of hotels, restaurants and bars just 5 minutes by car from the venue.